← 26 weeks down, 14 to go! My friends are terrible influences, thank goodness. Â While chatting with April over IM about camping this morning, I looked up Half Moon Bay State ParkÂ and found one of the primoÂ oceanfront sites available on one weekend night in late summer. Â So, Â in a spontaneous fit of optimism, I booked it. Â Those sites are impossible to get, even six months out! It is clearly fate. The campground is close to our house and blueberry will be 3 months old at that point, so maybe I’ll be cool leaving her at home overnight with Peter. Â Even if I choose not to go camping, April can still use the site, so either way, it’s a win! So, in honor of my likely-futile attempts to plan a night to myself 6 months from now, today’s Way Back Machine takes us to one of my very very very favorite things in the whole wide world: motocamping! 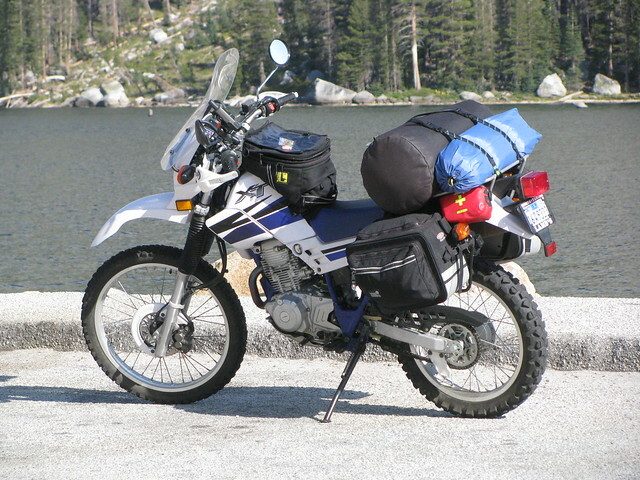 I first started motocamping in the spring of 2008 in preparation for my cross-country trip. Â It was really just an excuse to buy a whole crapton of new gear and pledge my eternal soul to REI. 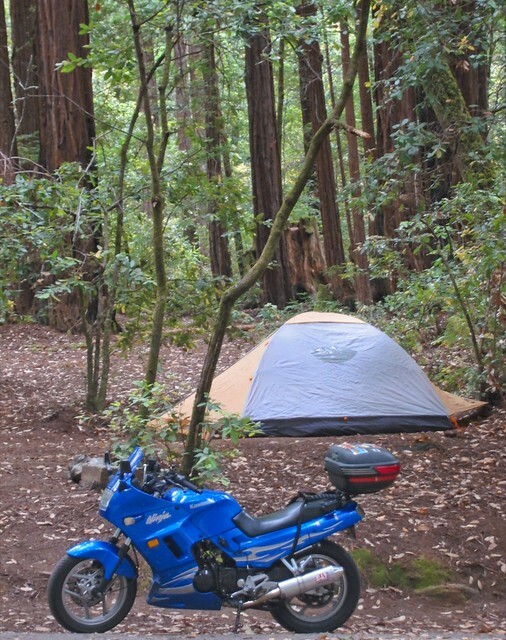 By the time Steph and I camped at Del Valle a few weeks later, I was actually enjoying the motocamping experience. 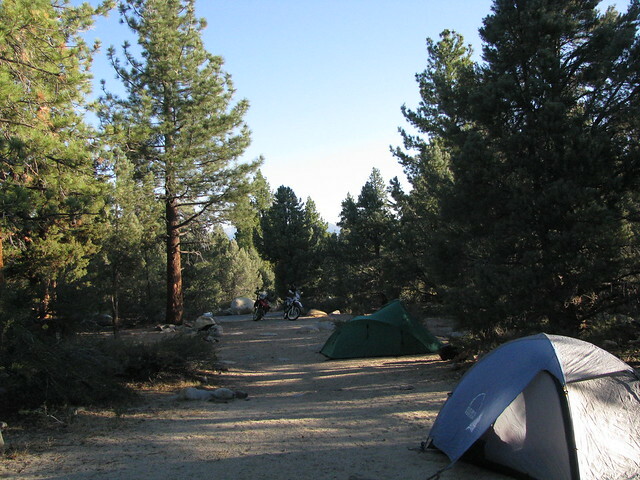 I only wound up camping twice on my cross-country trip in 2008, but they were such incredibly memorable experiences that now I can’t imagine doing a long distance trip without camping at all. A lot of my long distance touring is solo. Â In general, I prefer that; I like spending too long taking photos and riding too slowly and stopping at really boring rural museums. Â The Â only problem for me is the hours after the ride is done. Â If I pull into a motel at 6pm, I have an evening of sitting by myself and looking at the walls. Â Sure, I walk to dinner or read a book or sometimes take a bath, but there’s really only so much excitement to be found in the neighborhoods that generally house Best Westerns. 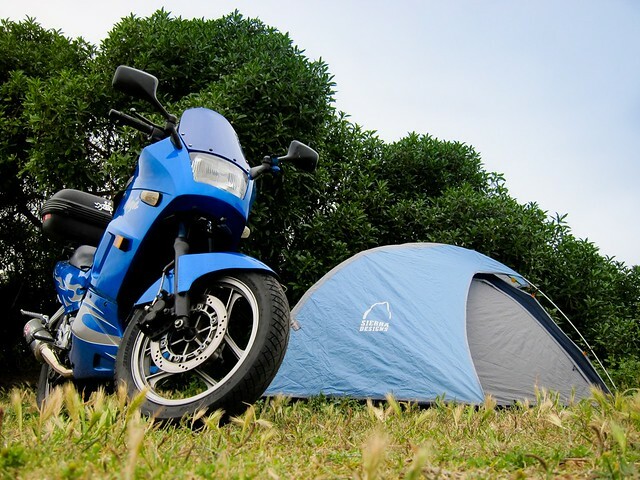 Motocamping, though…now that’s something different. Â First of all, it takes a while to set up all the crap. Â Now, most of that is intentional — I certainly don’t needÂ to be as big a princess as I am when I’m motocamping. Â But it makes me happy to move around and sett up my tent and my cot and my little cooking area and make myself a little home for the evening. Plus, there is always cool stuff to do at campsites. At Balmorhea State Park in Texas, I spent a wonderful evening wandering the spring pool after setting up my tent in a windstorm with some friendly neighbors. Even better, at Lake Fausse Point, Louisiana, I went for a very short hike after dinner and still managed to see birds, turtles, alligators, and armadillos. Â Unless something has gone very wrong, you don’t generally get that at Best Westerns. In fact, Lake Fausse Point is one of my trip highlights — one night of mosquito-bite infestation that stands out above so many other nights on a 6-week trip. Â When I think about touring in general, it’s one of the memories that pops into my mind and tells me “this is why you travel”. Â Just one night walking a .75-mile trail with armadillos and knowing my tent and my bike were there waiting for me. 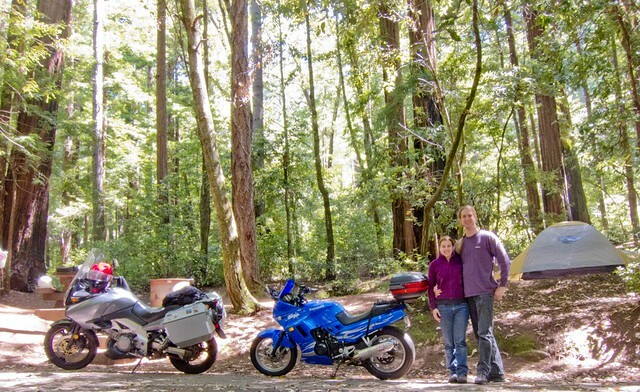 Of course, there have been many other notable motocamping trips, from dual sport trips on the XT225 to Women on Wheels camping weekend in Yosemite, to nearby overnight jaunts with Peter or April or Steph. My lunch break is nearly over, so rather than continuing to wax poetic, I’ll leave you with some more motocamping photos. This entry was posted in Way Back Machine. Bookmark the permalink. 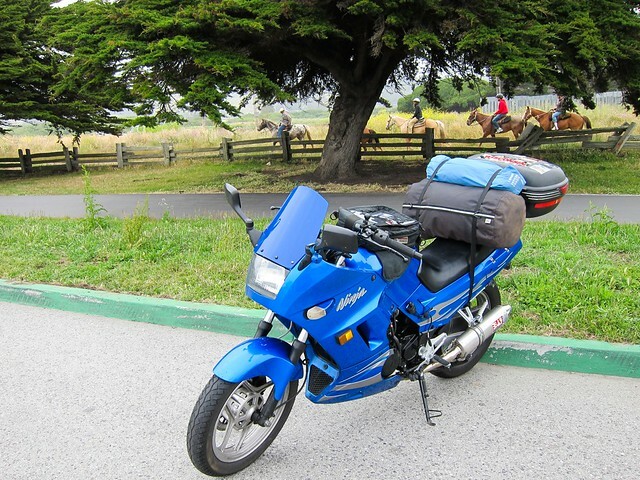 2 Responses to Way Back Machine: Motocamping! I went for a very short hike after dinner and still managed to see birds, turtles, alligators, and armadillos. Unless something has gone very wrong, you donâ€™t generally get that at Best Westerns. Your touring setup for the XT is impressive. What sidebags are you using, and how do you manage to keep the bag off of the exhaust?